NASA's Cassini spacecraft, in orbit around Saturn for more than eight years now, has delivered a glorious, backlit view of the planet Saturn and its rings. On Oct. 17, 2012, during its 174th orbit around the gas giant, Cassini was deliberately positioned within Saturn's shadow, a perfect location from which to look in the direction of the sun and take a backlit view of the rings and the dark side of the planet. Looking back towards the sun is a geometry referred to by planetary scientists as "high solar phase;" near the center of your target's shadow is the highest phase possible. This is a very scientifically advantageous and coveted viewing position, as it can reveal details about both the rings and atmosphere that cannot be seen in lower solar phase. 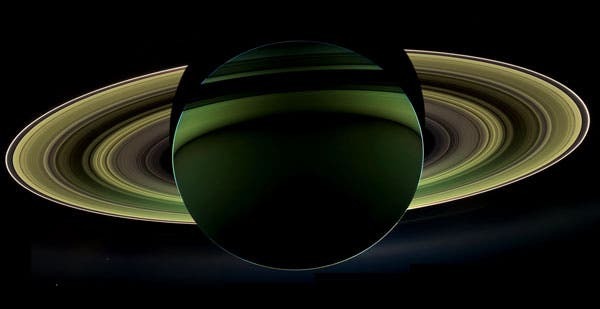 The last time Cassini had such an unusual perspective on Saturn and its rings, at sufficient distance and with sufficient time to make a full system mosaic, occurred in September 2006, when it captured a mosaic, processed to look like natural color, entitled "In Saturn's Shadow." In that mosaic, planet Earth put in a special appearance, making "In Saturn's Shadow" one of the most popular Cassini images to date. Saturn's Hexagon –"One of the Most Bizarre Things Seen in the Solar System"